In our guide you will find detailed information in regards to artificial grass cost and installation as well as up to 4 free contractor quotes. With so much innovation in artificial home sidings and fascias, it is easy to see why so many homeowners are abandoning authentic shakes and shingles for other longer lasting, low maintenance options. What once was a tacky, aluminum sheen on the face of a house, is all but indiscernible as artificial in the modern era. Nowadays, a preference to natural house faces seems almost like a preference for annual expenditures and massive paint projects once every few years. The bottom line is, vinyl and other artificial materials are water resistant, they do not rot, need not be replaced, and maintain color and shine. What’s more, while the cost can be great, it is but one cost, as opposed to the sum of the price paid in maintenance for traditional material every few years. That said, it was only a matter of time before the artificial mindset transcended the structure of homes and seeped into other elements of our properties. But what about artificial front lawns? Has turf made the great strides of vinyl siding in appearance and maintenance benefit that seem to offset that upfront cost? The answer to this question really depends on the homeowner. We tend to be bigger risk takers when it comes to do it yourself projects happening outside of the home’s structure, in the yard and the garden, but is the money saved by installing your turf lawn yourself worth it, and how do we even value the cost of a professional installation? It is difficult to know, since this type of install is not as normalized as artificial house face has become. But that is why you’re here! Below, I have outlined the step by step process to installing that forever beautiful front lawn yourself, its costs, all the outlying elements of the project that affect cost, and of course, how this all compares to kicking back and letting the pros do what they do. The size of your yard – As with any other type of home project, the price of your artificial turf will largely be determined by how much turf you will need to cover the square footage or acreage of your property. In some cases, it may be that there is only a need to cover the front portion of yard or the section closest to the street in artificial turf for the sake of curb appeal. However, it could also be that there is a particularly finicky section of yard in the back that you have had trouble sprouting grass from since owning the home. In any case, a certain estimation of how much area needs coverage is paramount to the cost of the installation. The topography of the yard is also something that will be weighed into the cost of the artificial turf installation. This mostly relates to the price point given by a professional landscaping company, as hills, slopes and other impediments will render more labor. It may be that in order to level a slope or hill more underlay is needed, or that the prerequisite work in preparing the ground for coverage is greater in one section of your yard versus another. On properties in wooded areas, or lawns with featured gardens or planting strips, the cutting and piecing together of sod runs may be necessary. This extra labor will undoubtedly be reflected in a cost estimate of the install. The type of grass you use – the type of grass you chose to install is a price variance that will matter both to do-it-yourselfers and pros alike. For artificial turf, price is typically contingent on the weight of the turf face. In other words, how robust or thick the grass look is will affect the weight of the grass. Heavier weighted turfs are typically more expensive. This is measured in ounces per square foot of turf. 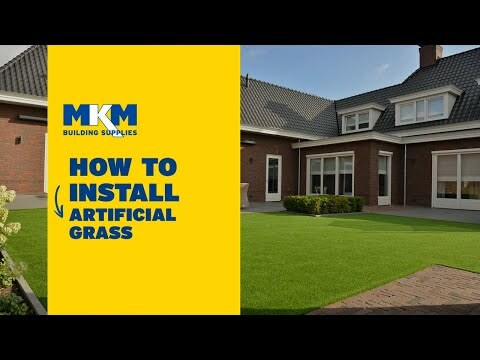 In order to assess whether or not you, as a homeowner, are prepared for the do-it-yourself artificial grass install, it is first necessary to look at what is in store for you as you undertake the project. Here is a step-by-step outline of what the process should look like with associated costs for each step. First and foremost, you will have to remove the existing grass that had at one time been planted on your property and likely is failing to flourish. While it may look dingy and lack fullness, it is still there, and you need to be sure to take the necessary measures in removing it in order to ensure a good solid underlay for your artificial turf. To do this, you will want to use a spade or turf cutter. Dig into the soil about one and one half to two inches deep. Also be conscious of the edging. You will want your new turf to sit about one half inch above any perimeters that are in place. This next step is important to prevent any weeds from growing through the artificial turf that you are to lay over the existing soil. A week membrane acts much like a mulch sheet roll- the roll of black mesh material that is placed over flower beds before mulch is dumped atop. In doing so, you create a barrier between the natural ground and the artificial turf so that nothing can peek through. To shape the sheet, use a utility knife or a pair of utility scissors, and don’t skimp on the cutting. Be sure every nook and cranny or natural soil is masked by sheeting or you can guarantee an annoying weed problem isolated to that very spot for years to come. Once the membrane is down over the soil and all area is sufficiently covered, you will want to add a thin layer of sand or crushed stone much in the same way you would if laying a brick paver patio. This is to ensure the weight of the turf malleable room to take a shape over the surface that you have predetermined. It is also helpful in managing the way water runs through the ground. In areas that are consistently more wet than others on your yard, lay more sand or stone to build up that area, creating pitches for the water to run off safely away from the foundation of the home. Apply a thin aggregate layer of sand, crushed stone or grit over the membrane. Compact it to create a solid base. This layer will provide you with a firm, well-draining surface that will support the rest of the materials. For sand, which is preferable to stone, figure one 50 pound bag will get you about three cubic feet of surface area at one half to one inch depth. This makes for some complicated arithmetic for us weekend handymen. Please see the Other Considerations section at the article’s end for more information on this. After you have laid the aggregate sand, you will want to drop another layer of sharp sand at about another half inch of thickness. Once that is done, compact the sand with a tamper. You can rent an machine tamper, but as long as you’re up for the challenge, and depending on the size of the yard, the force generated by a hand tamper will do the trick. After tamping, smooth over the surface using a flat board. This step is especially important to hilly areas if you have a vision of pitch in mind, or if you are remedying an especially steep pitch. The shock absorbent material is a nice to have but definitely not necessary, especially if you are trying to save money with a do-it-yourself installation. This will provide a nicer surface for the yard that can be great for the utility of the property for lawn games and having a catch with the kids. Thick of this as a synthetic rubber sheet, almost like a higher end version of what would go under indoor outdoor carpeting. To lay the shock absorbent material, you would follow a similar process as you did for the weed membrane, shaping the material using a utility knife. Full coverage is not quite as important here, as small corners of the yard and those areas near gardens are likely not getting much foot traffic. Now it is finally time to lay the actual artificial turf. You will want to start by aligning the first strip of grass to a corner or straight run of the yard. Make sure the grass is rolled out completely and butted up tight to the edge of the yard- wherever you deem that that is. Repeat this with each new section, butting up to the edge of the last rolled out section layed. When you reach those areas that must be shaped, lay the roll out first before cutting. Make sure your roll of turf completely covers the area including the impediment. If there is a tree or some other shrubbery in the way, be sure to account for the amount of turf that can be added to the other side of the obstacle out of the run you will cut to fit the obstructed area. This goes back to the old measure twice, cut once adage. When cutting, use your utility knife against a firm, straight edge. This is where you may be able to recycle some material, using the bubble level or board you leveled the surface with after laying the aggregate and fine sand. The short answer is no. Believe it or not, artificial turf is typically secured with what are basically large nails. The technical term in the landscape world is “anchoring spikes.” There are typically galvanized to avoid rusting and about six inches in length. Before you begin nailing, ensure the turf is perfectly laid, especially in the areas you cut to fit around trees and around flower beds. Drive into the corners of each piece of turf first. You will want to sink the nail in below the surface of the grass face, but not through it. Because of the many groundwork (pun intended) you have already done, and the many layers of various materials below the turf itself, the nail will hold pretty strong. Remember, that somewhere below there is crushed stone, so you may have to do some fishing for a soft entry point, but ultimately the stone will shape around the nail for further reinforcement. 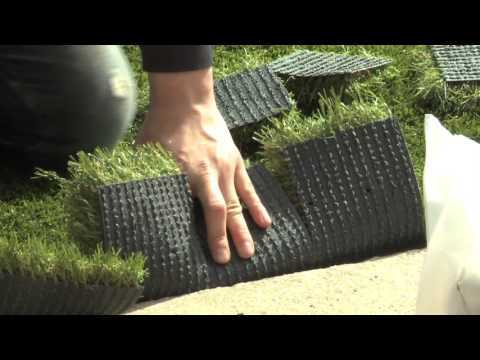 Once the corners are in, continue with a nail every foot or so along the edges of each piece of artificial grass. Point. So the turf has been laid and secured and it looks great! Awesome! You aren’t quite done yet, though. Applying a layer of silica sand directly on the lawn surface will help to stabilize the grass and keep it from sliding all around. Think of it as added material to fill in any bubbles of room available into which stone, or membrane, or turf itself may settle. For an even spread, use a coarse broom or brush to work the sand across the turf. This is also one of the few things necessary in regular maintenance of your artificial grass, and really only required to give your lawn a little lift when the grass face starts to look tired. Should it get dirty, you may also wash your turf with warm soapy water, working away any dirt or staining with the coarse brush head or broom, and rinsing the suds away with straight warm water. Because of your aggregate layers, the soapy water should run beautifully right where you aimed it. Follow the same rules for the silica sand as you did for the application of the initial aggregate and sharp sand in terms of pricing and square footage. Most of the cost analysis with regards to the installation of artificial turf is really a product of the size of your lawn, or more likely, how much of that lawn you want to case in fake grass. The reasons for the latter statement is that a quarter acre building lot translates to about 10,000 square feet. For our purposes, that seems like a lot of yard both to commission to a professional and to take on yourself. Instead of throwing those numbers around, which will just be a little scary and probably inspire us all to dig up our lawns completely and opt for dirt, let’s go with our street facing front yards, closest to our homes. By installing here, we are hopefully upping that curb appeal and taking some of the hassle out of the lawn care associated with the parts of our yards closest to our gardens, house faces, and windows. For the sake of cost analysis, lets go with 500 square feet. Below, find the material/cost tables collated for the do-it-yourself cost of the project. Note that this table has an added column for cost by projected square footage price. The totals at the bottom of the table reflect the range in material prices from low to high end, as well as projected cost both with and without the optional anti-shock underlayment. For professional installation, figure every bit of the costs above in addition to the cost of labor. The national average for landscaping contractors on artificial turf installation ranges from about $3-$5 per square foot. What does this mean for our 500 square foot area? A range of about $1,500 to $2,500 on top of the cost of materials. This type of project is an odd one when it comes to weighing the pros and cons of going to do-it-yourself route, or hiring a professional. At a total extra cost of $3,000ish dollars on the high end side, the labor is not the most astonishing cost of this project. That said, if you are going low end in terms of the brand and grass face weight of turf you use, then you either have some room in your budget to let a landscaper run the job, or you are really trying to pinch pennies, in which case the whole project can be done for under $3,000. On the other hand, if you’re installing the highest end material that’s out there, you’re going to want a professional handling it, and most likely, you are in a position to do so, based on the near $10,000 spent just on material alone. What is more realistic is you are somewhere in the middle, using a middle of the road product at roughly $8-$10 a square foot. In this case it is a matter of algebra. Substitute the value of the material by a dollar or so, and you create more room for labor costs with the same range and visa versa. As a somewhat straight forward project, if you have any handyman skills, it seems the logical choice is to spend close to the $10 a square foot range in material and take a stab at it yourself. Remember: it’s fake! So you really can’t mess it up! Figuring out how much sand you need for an area calculated in square footage (simply by multiplying length times width) can be tricky. This is because you need to also account for depth. What you end up with is a cubed footage. The problem with that is a lot of standard sands are sold by poundage. The information out there will tell you that a 50 pound bag will give you about 3 cubic feet. Great so that is 1 yard, right? Wrong. These are dimensions. We measured the area of our lawn at 500 square feet. This could be 50 x 10, 25 x 2, or any other multiple combination. It doesn’t matter, except to know that those numbers are a reflection of length times width of the area. For sand, we have to add another variable: the depth. Less than an inch is probably okay for artificial grass, but we estimate at one inch for two reasons. First, it is easier to calculate. Second, it’s better to have too much than too little. 10 feet wide x 50 feet long x 1 foot of depth = 500 feet cubed. We don’t need one foot of depth, though. We need one inch. So divide by the twelve inches that comprise that foot (500 feet cubed / 12 inches = 42 feet cubed). Take that 42 cubic feet within your 500 square foot area and divide it by the 3 cubic feet present in each 50 pound bag and you will need 14 bags.